Background Lifestyle changes are important for prevention and treatment of many common diseases, and doctors have an important role in the lifestyle counselling of patients. It is important to know more about factors influencing lifestyle counselling. 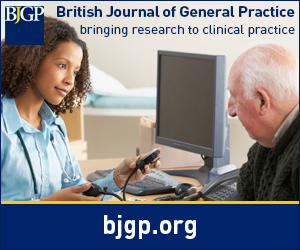 Aim To investigate the frequency of counselling about physical activity compared to that about alcohol habits; the impact of doctors’ own physical activity and alcohol habits on patient counselling about these lifestyle dimensions; and whether perceived mastery of clinical work or vulnerable personality have a confounding or moderating effect on these associations. Design & setting In this nationwide cohort survey, a total of 978 doctors in Norway were surveyed by postal questionnaires in 1993/94 and 2014. The response rate was 562/978 (57%). Method The outcome variables were questions on frequency of asking about alcohol and exercise habits. Explanatory variables were questions on doctors’ own exercise habits, drinking habits (using Alcohol Use Disorders Identification Test [AUDIT]), perceived mastery of clinical work, vulnerable personality, and specialty. Associations were studied by linear regression analysis. Results Of the 526 responders, 307 (58%) reported asking usually/often about exercise habits, while n = 140/524 (27%) usually/often asked about alcohol habits. A doctor's own physical activity level was associated with frequency of asking about physical activity (unstandardised regression coefficient [B] = 0.07; 95% confidence intervals [CI] = 0.01 to 0.13). There were no significant associations between doctors' own lifestyle habits and counselling on alcohol habits. Doctors with low levels of vulnerability asked more frequently about physical activity, regardless of their own physical activity habits (F = 2.41, P = 0.048). Conclusion Doctors’ own lifestyles influenced their preventive counselling about physical activity, but not about alcohol. Vulnerability moderated these effects, indicating the importance of early interventions to help doctors with a vulnerable personality to handle negative criticism from patients.